This weeks image is another from the harsh Eurasia Steppe of central Mongolia. Looking at this picture, for some reason you get a feeling that the temperature would be hot and dry, but that couldn’t be any further from the truth. It was actually just above freezing outside with the temperature hovering around 5c to 6c. At night it would drop below freezing and would sometimes snow. 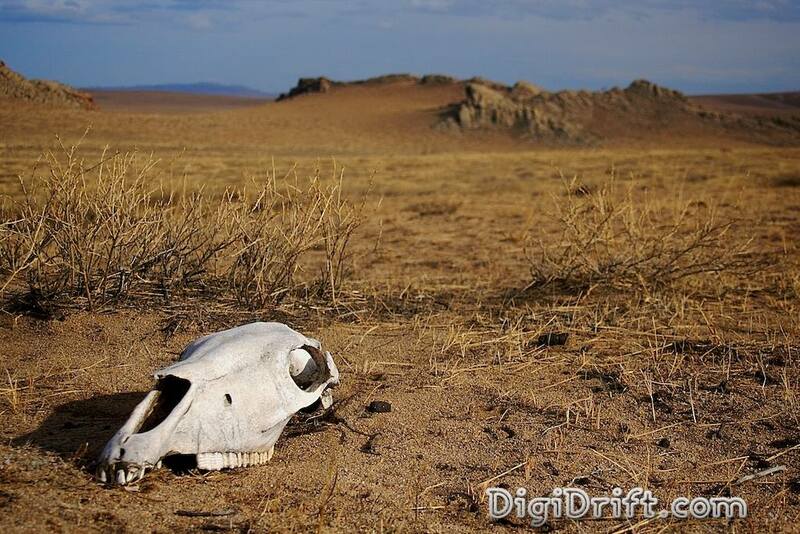 The Mongolian Steppe is a harsh land, and we were witnessing it mid Autumn. During the winter months the temperature will drop to 30c below with the harsh Siberian winds blowing from the north. During an afternoon hike I stumbled over this yak skull and though it made for a nice capture. Great perspective here. I like your description to! Many people don’t realize how cold a desert can be! I seem to remember having to wrap up a lot in the Sahara. Dry, cold, freezing at night, and desolate and utterly beautiful! Aaron – Thanks for the praise mate. I appreciate it. Dave – It’s hard to imagine it was actually freezing when I took that photo, completely loaded up with a Gortex jacket, thermals and a fleece. Looks can be deceiving I suppose, and they certainly were on that day. There’s no doubt your time in the Sahara must have been memorable, and I hope to get there one day myself. Thanks for your comment. I appreciate it. Jason, you have some amazing photographs, and this one is in those ranks as well. You are right, my first instinct was that it was hot and dry in this landscape, not cold. Very cool perspective with the yak skull. Well done. Hey Peter, thanks for your praise I appreciate it. It’s like an illusion but in the mind. I suppose you just go with your first instinct, and that being the land is hot and dry. That’s the way most people would see it, including myself. Hey Rajeev, I know exactly what you mean. Living in a city can be tiresome and the feeling of returning to to open air is definitely soothing to the soul. Thanks for stopping by.